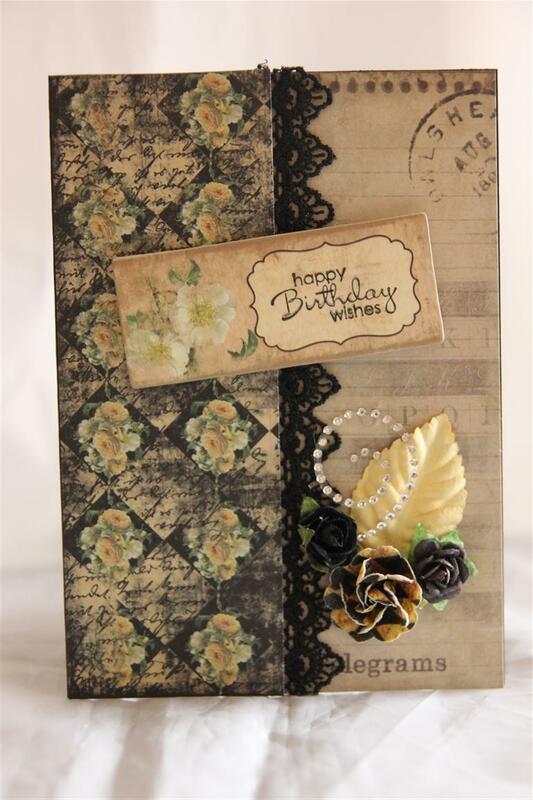 Three more cards today made with Prima Tea Thyme paper collection, and matching stickers and chipboard. 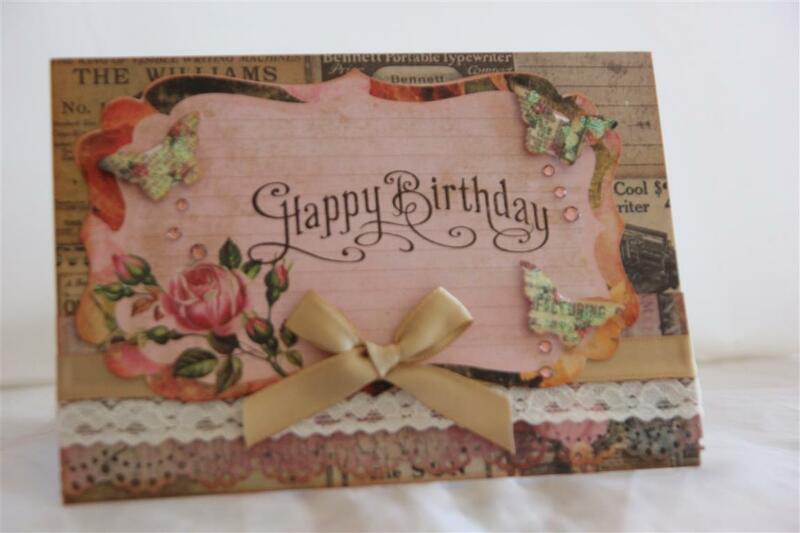 On all these cards I have also used bling, lace, ribbon,and flowers, or a mixture of these embellishments.One more post with this paper and then we will move onto something else. A busy weekend with not much crafting, although I did get my classes for April done. This week I have my new kitchen being installed, so its been a busy time getting ready for that, and I had a primary school class reunion yesterday, so lots of time spent catching up with old friends I hadn’t seen for over 40 years! Hopefully next weekend will be a little quieter! Til tomorrow…. 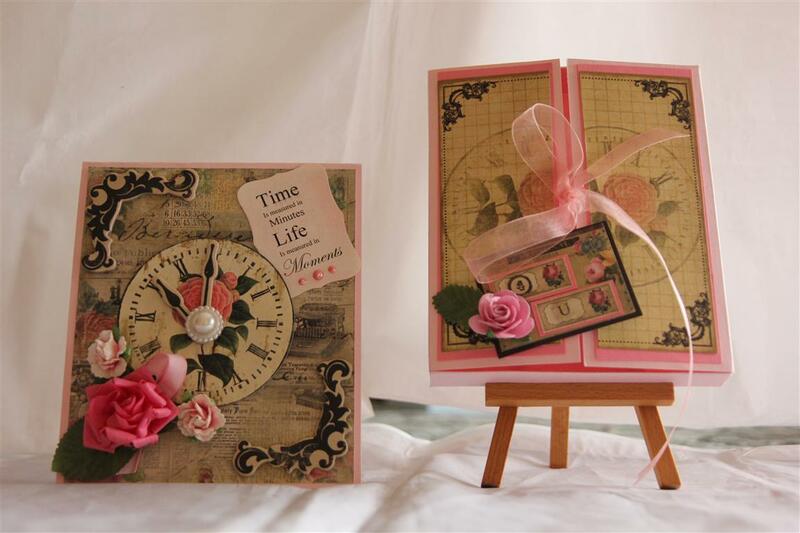 early post today as I may not get back on here today… very busy…..Prima tea Thyme collection – the top card also uses the matching stickers, and some pearls, ribbon and lace. 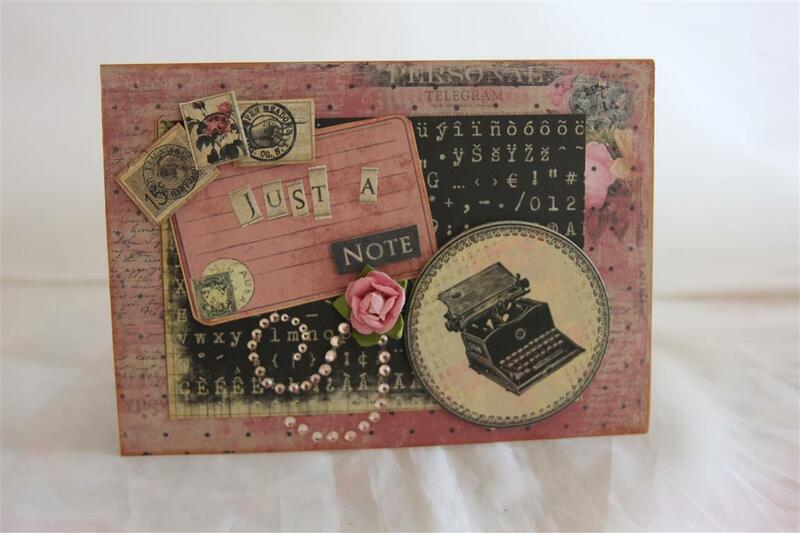 the bottom card uses all that, plus some chipboard which I stamped on with staz-on ink and a stampin up sentiment stamp.Staz on ink is the best for these shiny chipboard pieces because it doesnt smudge.Til tomorrow….. So, the very first collection of papers I took out to sort through was Prima tea Thyme. I didn’t get very far in the sorting out, but got streets ahead in the card making, and none of this paper made it into the discard pile!The top card had so much embellishing including…ribbon,lace,punched butterflies,rhinestones,kindyglitz,letter stickers, chipboard,and a flower. 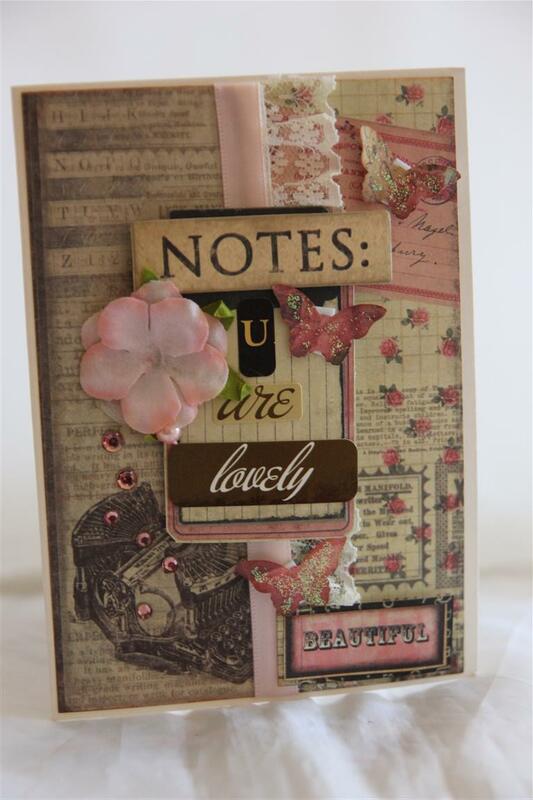 The bottom card escaped most of my over the top embellishing and just had a journalling card from the same collection,punched butterflies, ribbon ,lace and rhinestones.A few more to show in this collections but we will do them over the next day or two in groups of two or three. this morning I taught a class over at Paper Flourish, and as usual enjoyed my time spent with my ladies,who are much more like friends than students! Til tomorrow…. 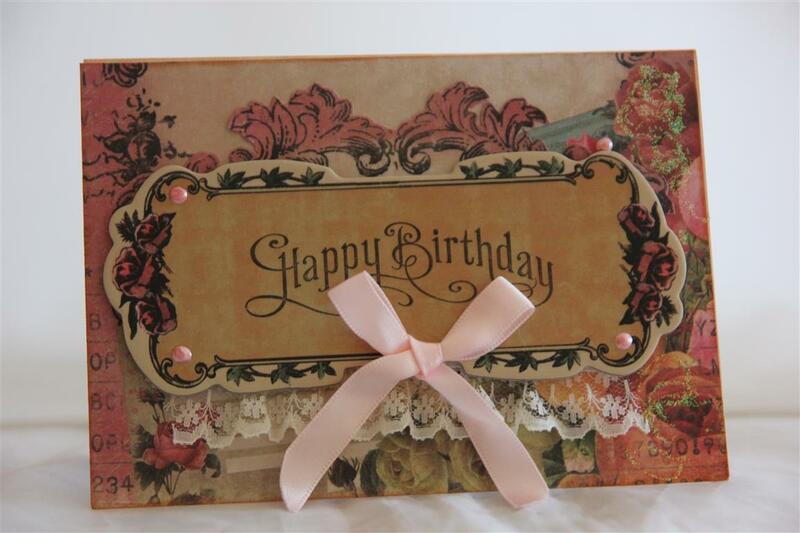 This card is my favourite, made with prima Tea thyme 6″ pad, and matching collectables. I made the box to match ( you can see how to make this simple box on a you tube video I made titled card i9n a box box) and I added some flowers, ribbon and bling to decorate. Nathan and I have spent the morning taking photos of my most recent makes, so we will have something new to look at once he has put the photos on my computer.With Mothers day only a couple of months away, I will be concentrating on these cards this week, and I have a lesson to set up as well, so thats this week sorted! Til tomorrow…. 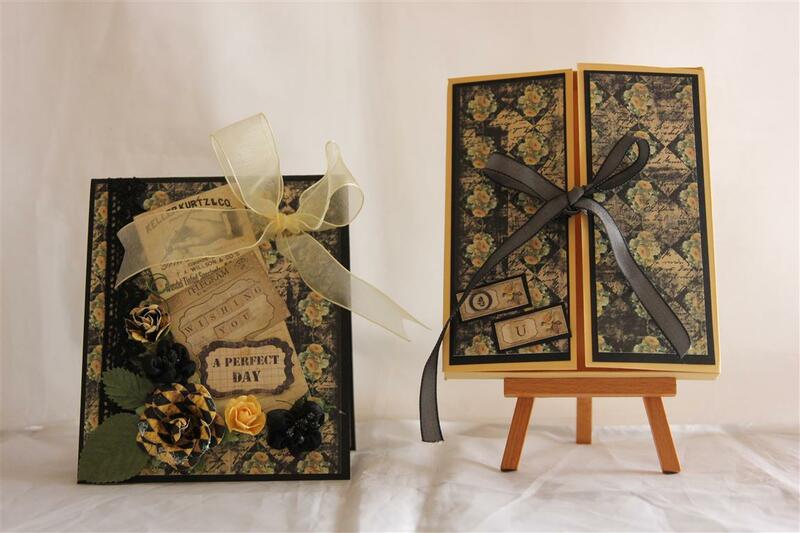 I really enjoy making these cards in boxes, and I have done a You Tube video ( titled card in a box box) to show how I make these very simple boxes.For this one I used Prima Tea Thyme 6″pad, and matching flowers. I added some ribbon, lace and an organza bow to finish.The tags used are all found in the 6″pad.I have been amazingly creative this week, and have made close to 40 cards, which I now have to organise Nathan to photo , and I have been very naughty and not done the inserts, so tonight I will be going through them all inserting the verses!That is the most boring job… which explains why I haven’t done them yet! Til tomorrow…. When I use 6″ paper pads, I always end up with 2″ strips left over, so for this card I used 2 of the strips, and ran some lace down the join. 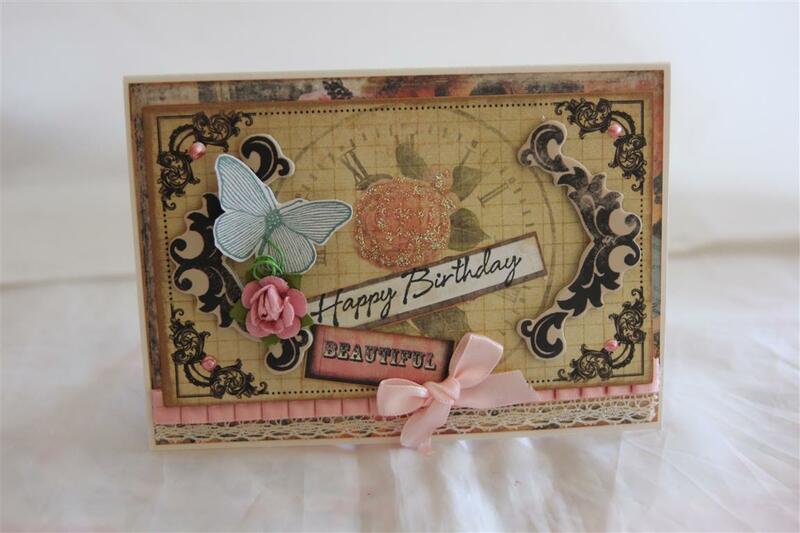 The paper , flowers and chipboard are all from the Prima Tea Thyme range, and I added a little bling flourish.I am making good headway sorting through my old papers, making the occasional card as I go, and collecting a little pile to give to my sister ( who has just started making cards) and my mum. I will have a little break tonight as I bought some gorgeous wool today, have dug out my knitting needles, and am going to start on a scarf ready for winter! Til tomorrow…. 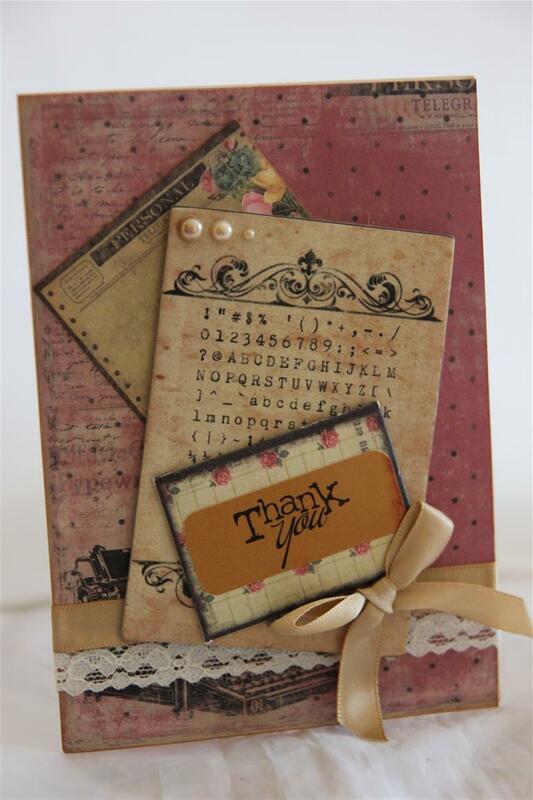 We are revisiting Prima Tea Thyme paper collection, made using the 6″ pad. 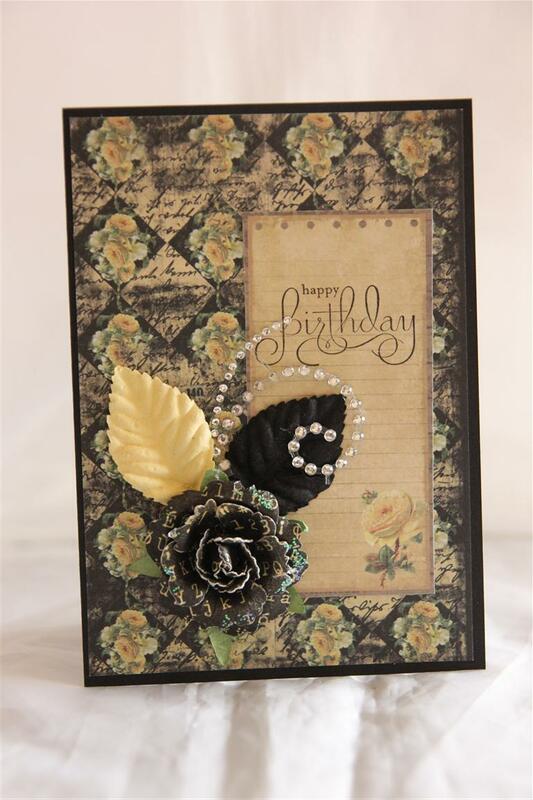 I have matted the paper onto black cardstock, and added some prima flowers and a bling swirl. 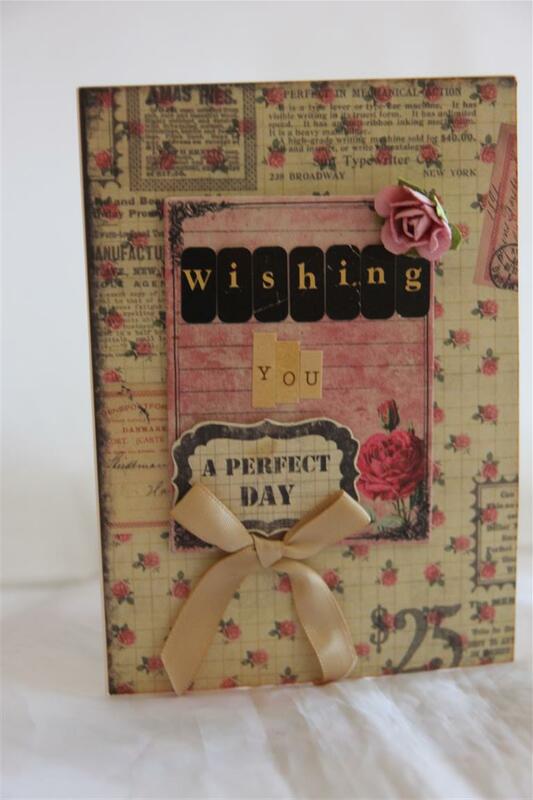 the sentiment is stamped with a stampin up stamp.Very quick and easy card!I have made great inroads into my mens cards today, and can now pack up the browns, greys and blues and break out some lilacs, pinks, and pastels tonight. I am going to go back to some previously underused papers, and clear a little room in the craft room, to make room for all the lovely papers coming through from CHA….Til tomorrow….